Some clients have moisture build-up in the ear faster than others, which can be exacerbated if the loss prevents venting. Winter weather, too, can cause moisture build-up inside conventional PVC tubing. This effect may bridge the tube wall to the extent that the sound bore may become occluded. This can cause the same effect to your patient as the instrument cutting out. This problem can be reduced or eliminated with the installation of a dry tube and if possible, a vent in the ear mold. The Libby Horn tube uses the horn effect based on Mead Killion's research on stepped bore design to increase high frequency response. While belled bores help to emphasize high frequencies, the best acoustic properties are achieved with a flare length of 22mm, longer than most ear canals. The tube is a one-piece design of exactly the correct length to best emphasize high frequencies, available in 3mm or 4mm diameters. The 3mm size provides approximately 6-8 dB of additional gain and output in the higher frequencies, while the 4mm will add 10-12 dB. While the 4mm size will allow approximately 5dB more gain than the 3mm size, physical ear canal dimensions limit the use of the 4mm size. As a standard practice, we will determine the size of Libby Horn, which is most suitable for the canal dimensions, and vent size, if one is ordered. Of course, if you specify a particular size, we will do our utmost to accommodate your instructions. 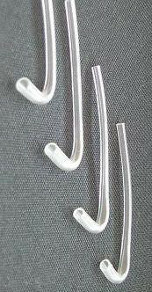 Dry Libby Horns are available in 3mm size only. Regular Bore This is our normal 2-3mm bore commonly used when the hearing loss is even across the board. Belled Bore By adding a large 3-4mm bore at the end of the canal, without tubing, we closely replicate the use of a Horn tube, with the attendant slight increase to the high frequencies. Reverse Bore By using stepped diameter tubing, we create a bore 1mm in diameter, enhancing low-frequency sounds for reverse-slope losses. Open Bore Commonly used for sloping high frequency losses. The canal is cut short and hollowed, as in the HFE and Acoustic Modifier styles. Fishmouth This is a shallow bevelled cut at the end of the sound bore, which acts as a cerumen trap, rather than a true acoustic modification. Parallel Vent This is the preferred venting style for most applications; and the one that we will always install when we are able, unless otherwise requested. The sound bore and vent pass through the canal portion of the earmold side by side and do not intersect. Diagonal Vent (Angle or Branch vent) The vent intersects the sound bore between the end of the tubing and the end of the earmold. This style of vent is not recommended, unless space prevents the use of a parallel vent. External Vent (Trench Vent) This configuration is a groove or channel along the bottom of the ear canal. It is used when drainage or discharge from the ear is a problem, or if there is no room to install an internal vent inside the canal. Select-A-Vent Done as a parallel vent if space permits, the SAV option comes with a set of vent inserts, allowing the hearing specialist to change from totally open to totally closed or options in between in a matter of seconds to suit the loss. At Emsee, we use Metric measurements when we prepare earmolds. For your convenience, here is a chart showing approximate conversions between Imperial and Metric measurements.